There is a longstanding debate about the relative merits of emissions trading and carbon taxes. However the distinction between the two types of instrument is not absolute. 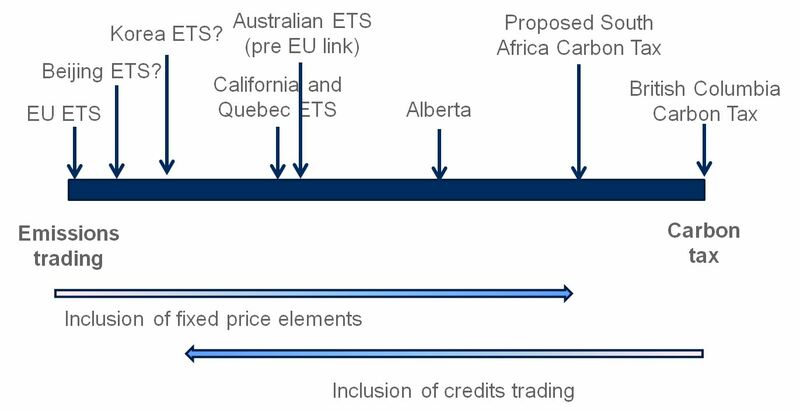 Emissions trading schemes can have fixed price components or limits to price ranges, which introduce an element of price certainty, while taxes may allow a degree of trading in the form of offsets or credits generated from outperforming a baseline. Emissions trading and carbon taxes are thus at two ends of a spectrum of possibilities. The best policy choice is not necessarily at either end. The chart shows some major carbon pricing schemes around the world on a spectrum from pure emissions trading on the left to pure carbon taxes on the right. A pure ETS any ETSs contain some element of price certainty, and taxes may include elements of trading, so many schemes do indeed in practice lie somewhere between the two extremes. The EUETS is a pure emissions trading scheme, with no limits on price at the moment, although there are also some very limited auction reserve provisions available in the EUETS. The Chinese schemes may not have explicit price management, although there appears to be considerable informal influence on the price within fairly illiquid markets. This may evolve into a role analogous to the role a central bank might play in currency markets, or by some other means. The Korean scheme appears likely to have some price containment mechanisms in place but their form currently remains undecided. Several other schemes diverge from the model of a pure ETS by having elements of fixed pricing. The Regional Greenhouse Gas Initiative (RGGI) in the Northeastern USA, has a low reserve price in its auctions (around $2.00, indexed to inflation), and also price containment mechanisms allowing for additional supply to be made available at specified prices. The Australian scheme includes an initial 3-year fixed price period. It was intended that after the 3-year fixed price period it would include a floor price in the auction and a ceiling related to the international carbon price. However these may never in practice be implemented as the repeal of the scheme seems likely to proceed (the floor price was anyway intended to be abolished with the agreed link to the EUETS). This made its original design much closer to the California and Quebec schemes, both of which contain reserve prices in the allowance auctions to give a price floor, and also price ceilings in the form of reserve tranches of allowances. Floor prices are currently just over $10/tonne, well above the levels found in RGGI, and indexed to rise at above the rate of inflation. The Alberta scheme is a hybrid between a tax and an ETS. It sets a baseline for emissions from an entity per unit of output (emissions intensity), rather than a fixed emissions cap. If emissions are below this baseline then credits are generated. If emissions are above the baseline then the entity has several options: it can buy credits from those in surplus, it can purchase offsets, or it can pay a fixed price of $15/tCO2 which goes into a fund for clean technology investment. It thus resembles a carbon tax payable above a threshold level of emissions intensity, but with some element of trading allowed. The proposed South African carbon tax would, if introduced in its currently proposed form, allow some of any remaining obligation to be met through offsets. At the other end of the spectrum the British Columbia carbon tax is a solely a tax, with no element of trading at present (and only very minimal provisions for offsets). In the longer term political processes introduce dynamics which may ultimately limit the extent to which a carbon pricing scheme focus is exclusively on price and quantity. Decisions about the level of the cap are likely to be influenced by expectations of the prices that will result. And if a surplus of allowances leads to low prices a tightening of the cap may be considered, as in both the EUETS and RGGI at present. Similarly the level of a tax may be adjusted over time to meet an environmental goal, or other policy objectives such as raising revenue. So policy debates should be less about a preference for taxes or emissions trading in their pure form, and more about where a scheme should be positioned on the spectrum of possibilities, and how outcomes can be managed over time as the scheme develops. And even if a scheme starts at one end of the spectrum, events may force changes that recognise that in practice there is always a balance to be struck between prices and quantities.